A firefighter from Truck 47 exits the building in his full turnout gear and SCBA (Self Contained Breathing Apparatus). More than 100 Chicago firefighters battled an extra-alarm fire today in Lakeview that consumed two apartment buildings. The fire that began just before 1:45 p.m and sent black smoke across the North Side. It started near a wooden stairwell behind a three-story building on the 800 block of West Cornelia Avenue. The flames soon crept up the stairwell, setting ablaze apartments from the bottom up and sending dozens of nearby residents to the street. 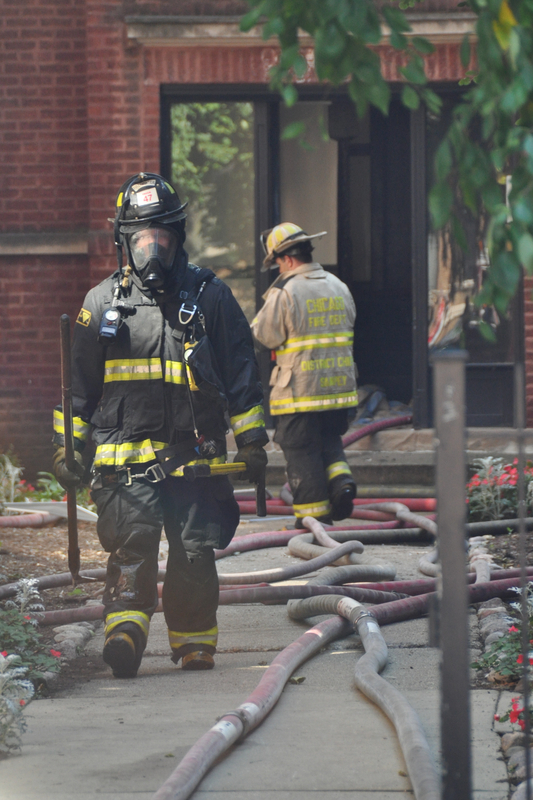 This entry was posted in Chicago, Fire Department, Firefighters and tagged 2011 fire, 3-11 alarm fire, Extra Alarm fire in Lakeview, Lakeview Neighborhood Fire, Saturday August 27. Bookmark the permalink.